In a lot of publications, you see combined data for Skimmed Milk Powder (SMP) and Nonfat Dry Milk (NDM). They are very similar. Both remove the moisture from skimmed milk by drying and end up with a powder, which can be reconstituted by adding water. So why do we have the same name for two identical products? Well, they are not identical. The real difference begins with who defines the standards for the product. Most of us would have correctly guessed that NDM is defined by the USDA/FDA and the specifications are listed in the Federal Code of Regulations (FCR). There are standards for flavor, physical appearance, bacterial plate count, milkfat content, scorched particle content, solubility, and acidity, with different parameters for "standard grade" and "extra grade." The specifications also define three different levels of heat used in the drying process. The specifications are detailed, specific, and available at this address. NDM can be shipped without refrigeration and used to reconstitute milk, or as an addition to whole milk to meet the protein requirements for efficient cheese manufacturing, or as an ingredient in many other edible products. So how is SMP different? It begins with who sets the specifications. In some of the earlier posts to this blog, there has been discussion of the World Trade Organization (WTO), and other groups primarily located in Geneva, Switzerland. They negotiate, set, and arbitrate the standards for products traded globally. For food products, the standards are defined in the "Codex Alimentarius", Latin for "Food Code." The U.S. is a member of this group, as well as 186 other countries. The complete file can be viewed at this website. The standard for SMP can be viewed at this website - Pg 54-57. The standard for SMP does require a minimum protein level of 34% which is not required by NDM. The standard foe SMP does allow for the use of stabilizers, firming agents, acidity regulators, emulsifiers, anti-caking agents, and antioxidants, and appropriate protein concentrates. These items are not allowed in NDM. Because of the additives allowed in SMP, its use as a protein enhancer for cheese manufacturing is limited. SMP is almost totally an export item for the U.S. A great deal of NDM is also exported, primarily to Mexico; however, SMP is really the international product which competes head on with the EU, and New Zealand in the international markets. It is possible to produce a product, which meets both standards. The protein content of SMP is based on nitrogen content whereas the Federal Order standard for milk production is based on "true protein." For the same product, protein based on nitrogen content runs approximately 5% higher than true protein. When protein levels are defined by the same standard, typically NDM meets the protein level requirements of SMP. If the additives allowed for SMP were not added, SMP would meet the requirements defined for NDM. However, the various additives in SMP can provide some benefits which buyers may be requiring. Sales of SMP are very dependent on the international market. As can be seen below, production of SMP peaked in 2013 when demand and prices peaked in the international markets. In 2014 and 2015 and continuing in 2016, sales of SMP have decreased. The chart above shows that international business can be more volatile than domestic business. This has been covered in prior posts (Free Trade Agreements and TPP) and is reinforced here. Whole Milk Powder (WMP) which is also in the classification of powdered milk has not been a major product in the U.S. However, other countries like New Zealand make and export a lot of WMP. It is a major item in the international market. The U.S. has been growing this business, but it is still quite small compared to NDM. The Standard used for WMP production is based on the Codex, as it is primarily an export item. For more details on the differences between NDM/SMP, see my recent article in Progressive Dairyman. Export and import data for October 2016 showed continued improvement. Exports volumes of all commodities used to price producer milk were up. 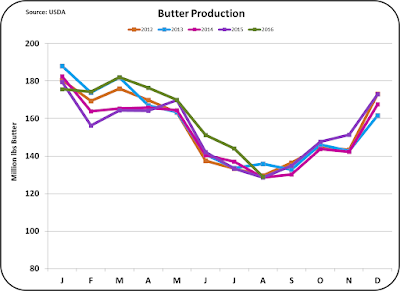 The largest percentage increase was butter, but that increase is based on a very small export level. More detail on butter is covered later in this blog. The most important item is cheese as it has the largest impact on milk pricing. 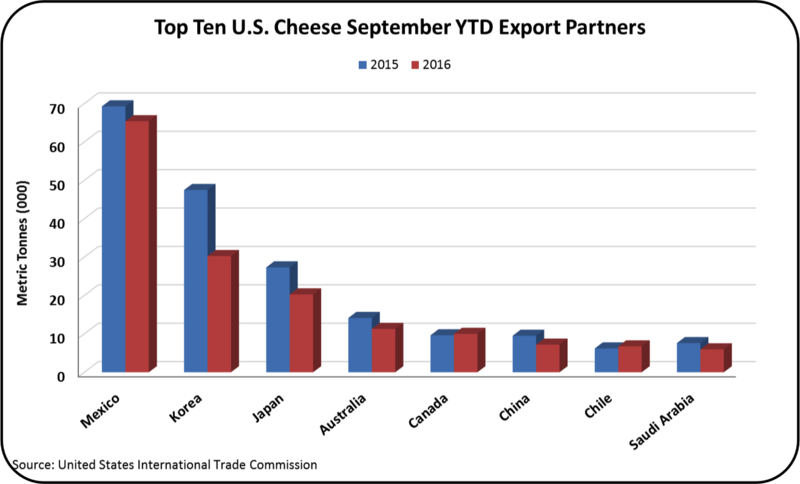 The 9.3% increase in cheese exports is significant for this time of the year. 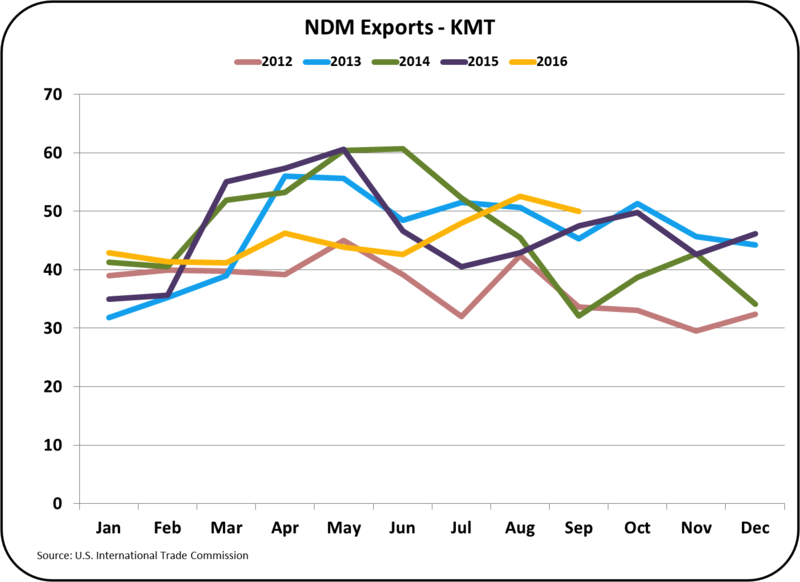 NDM exports which have remained strong in 2016 are showing increasing strength with a 10.2% increase in export volume. Imports of cheese typically rise in the fourth quarter of the year with the holiday demand for specialty cheeses. The increase in October is in line with the two prior years. 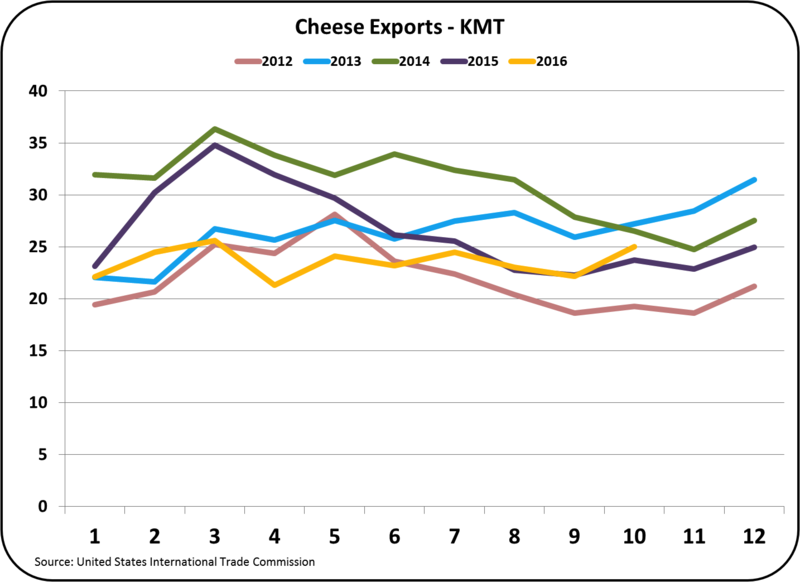 The most important chart for improved producer prices is the chart below on cheese exports. 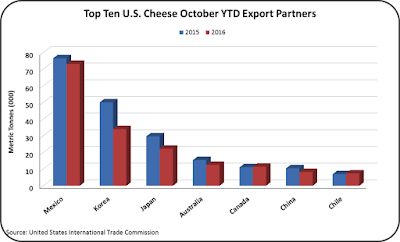 The October volume of cheese exported is above the 2015 level and near to the levels of 2013 and 2014. While exports YTD are still off for the three largest export buying countries, October levels are hopefully the start of a positive trend. 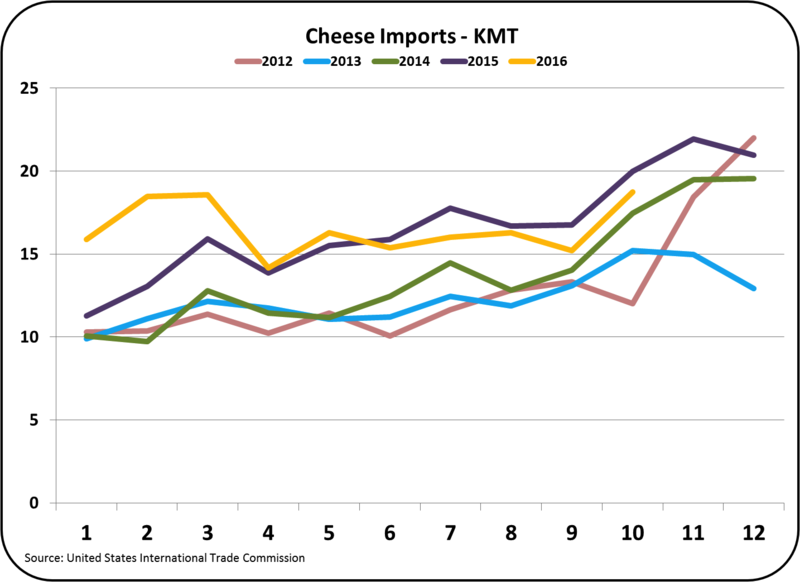 Cheese imports coming from Italy and France are close to 2015 levels, but imports from New Zealand are significantly higher YTD. 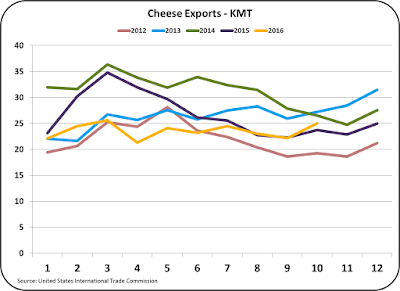 The higher import levels from New Zealand represent the availability and low prices that have persisted in the international markets for commodity cheese. 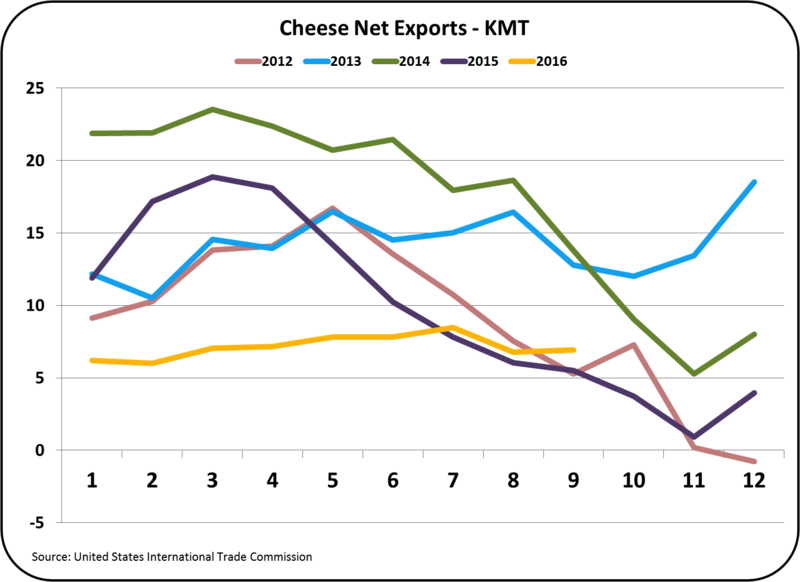 Overall, cheese net exports (exports - imports) remain low as compared to 2013 and 2014, but the October levels remain near the 2016 levels. October net exports typically fall more due to high imports. However, the increased level of exports in October 2016 kept net exports at prior month levels. 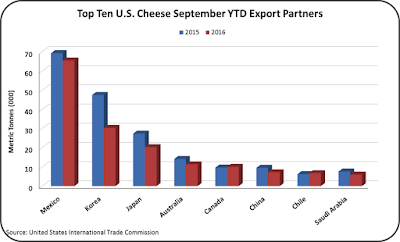 This is an indication of a strengthening export market for U.S. cheeses. Butter remains a complicated story. U.S. per capita consumption continues to rise, but production of butter remains near prior year levels. This has kept inventories relatively tight and domestic prices high. Butter net exports did show an improvement with exports up and imports down. 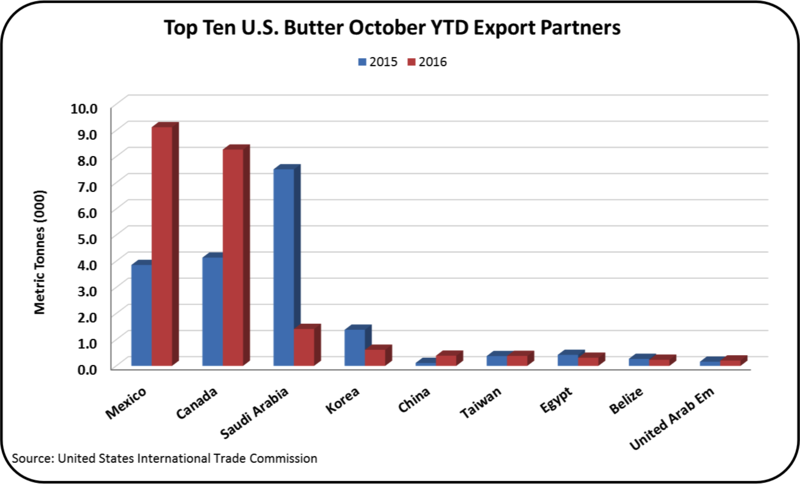 The real activity in the butter export/import market is trade with Mexico. Mexico is the largest export partner AND is nearly the largest import partner for butter. There are no volume restrictions on exports and imports due to the NAFTA agreement. 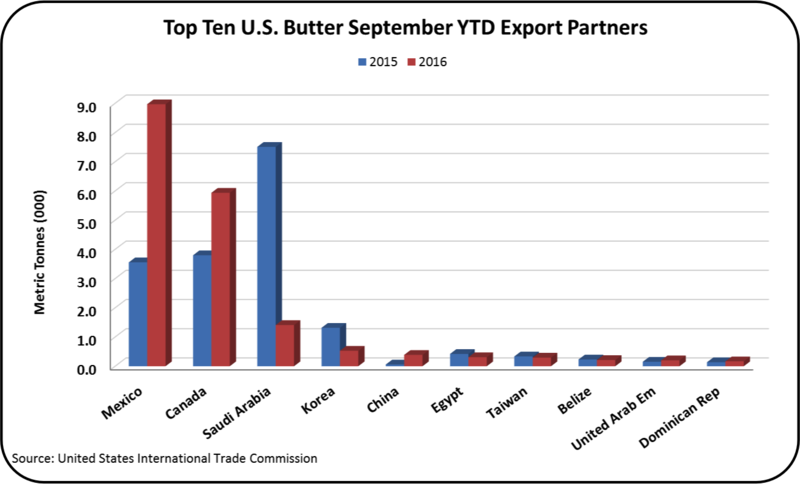 YTD more butter has been imported from Mexico than exported. Changes from 2015 show a huge shift in the market. 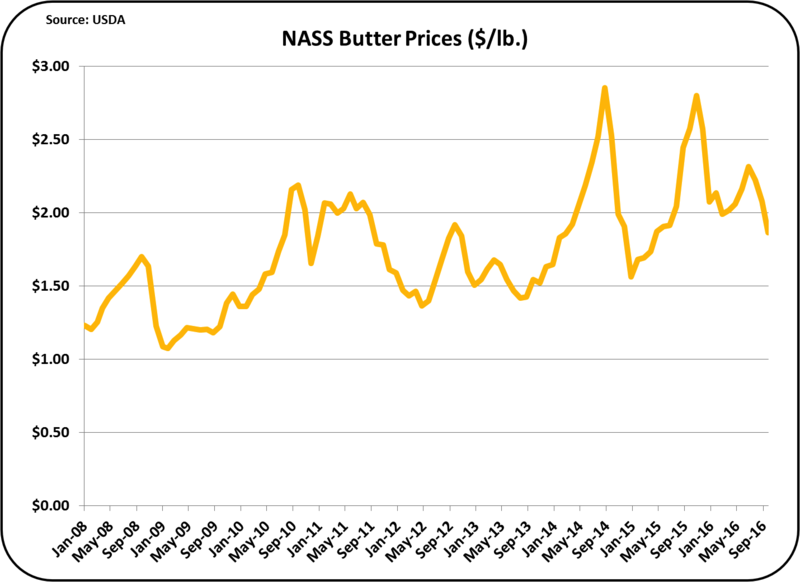 U.S. domestic butter prices were well above international prices, at the beginning of 2016, but international prices have increased roughly 60% since the beginning of 2016 and are now comparable to U.S. prices. This should provide an opportunity for increased exports of butter although available supply remains tight. 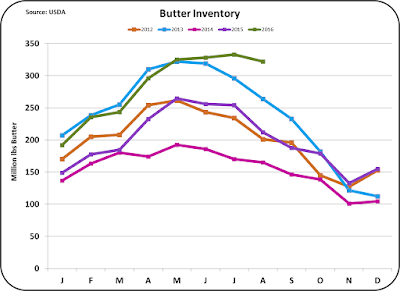 As shown in the first chart below, exports of butter to Canada have been significantly above prior years. This change is relatively recent and its continuance is uncertain. 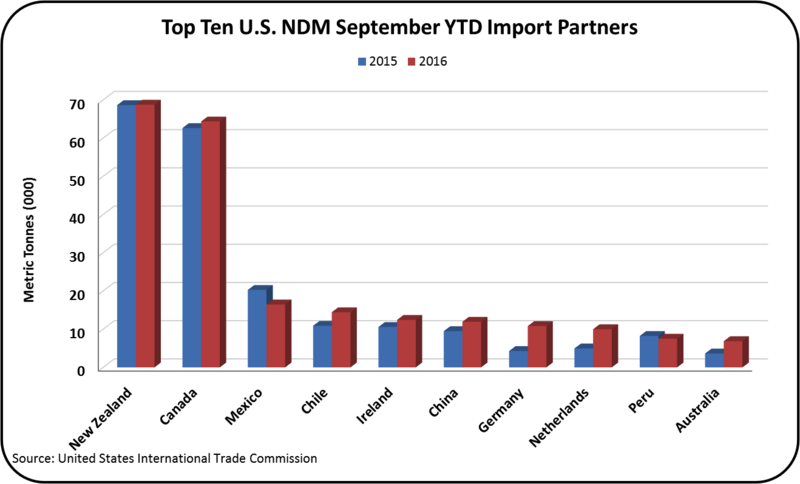 Exports of NDM have been the strength of the dairy export program in 2016. While prices have been low, volume has remained steady and growing. The last three months exports have all been record for that month. October maintained and improved on that record. While prices remain well below the early 2014 levels, they are currently up roughly 50% from the beginning of 2016. The futures market is forecasting additional increases in NDM prices. Mexico remains by far the largest export market for U.S. NDM, however, the growth over the prior year is coming from other markets. 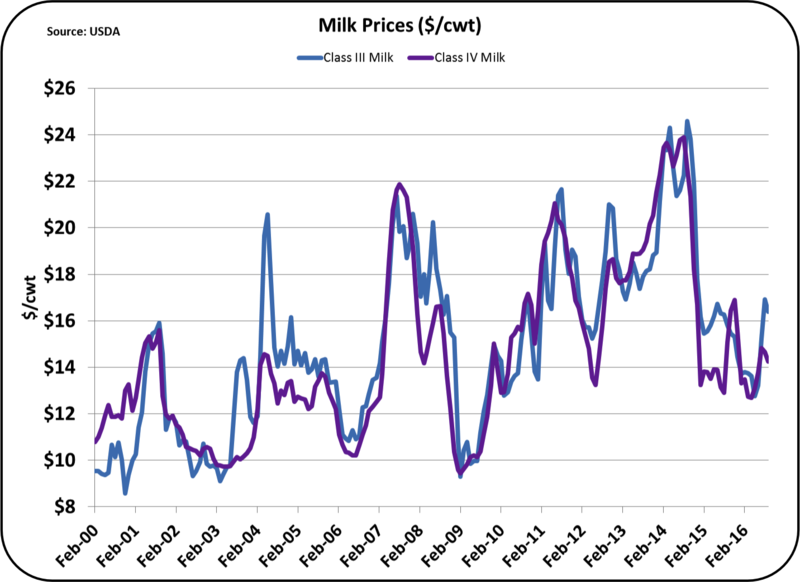 NDM prices are the basis for Class IV milk prices and in turn Class II milk prices. See the potential impact of Class IV pricing in the July 16, 2014 post to this blog. 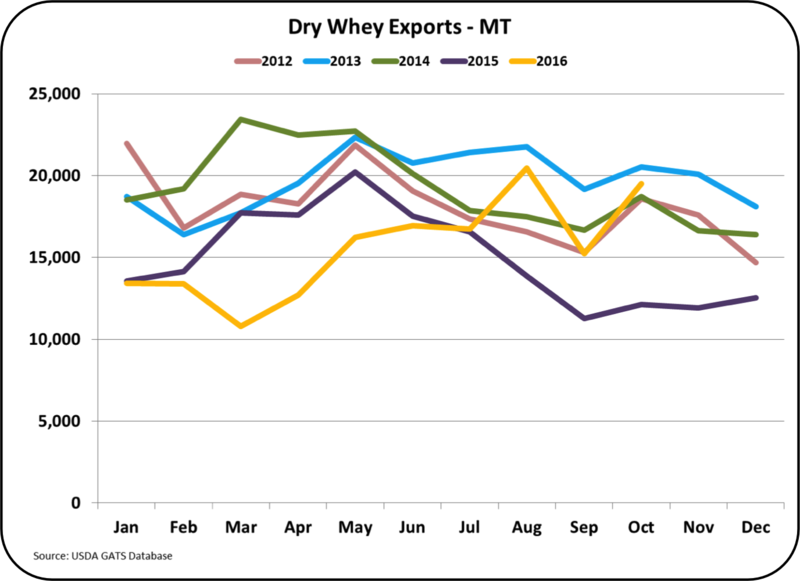 Dry whey exports have seen increasing strength during 2016. Exported volumes are above every one of the five prior years except 2013, and they are near the 2013 level. 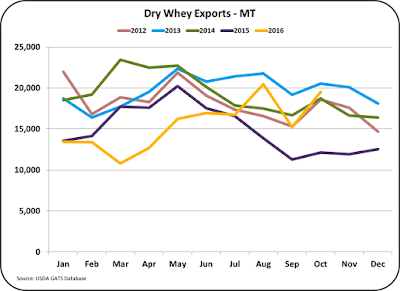 As mentioned in the prior post, prices of dry whey have improved during 2016 and are expected to increase further in the coming months. Dry whey is the basis of pricing for Other Solids. 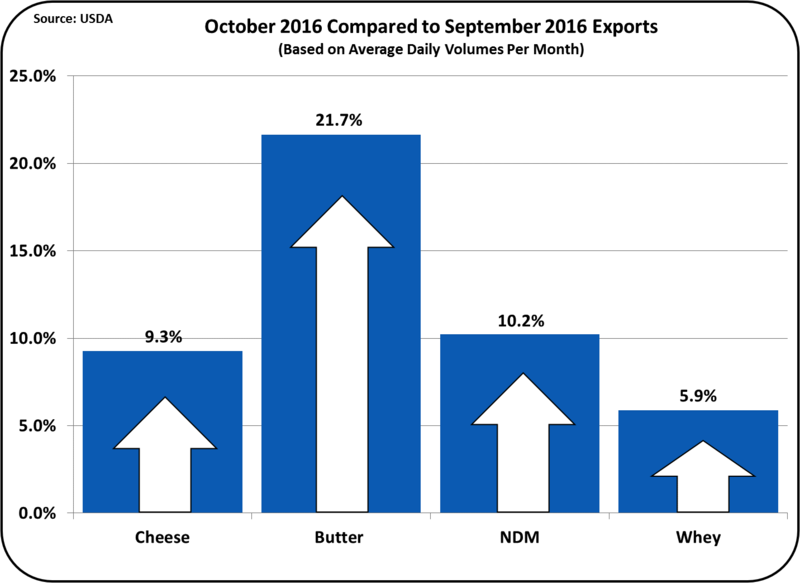 October has been a very positive month for dairy exports. The global dairy market seems to be getting supply and demand more in line and international prices are improving. The one remaining issue for export prices is the strong USD. 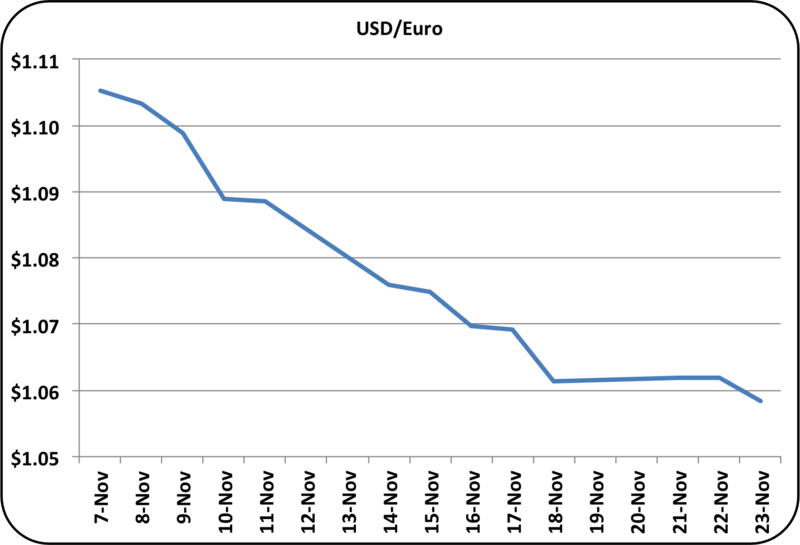 Since the U.S. election, the USD has strengthened more. 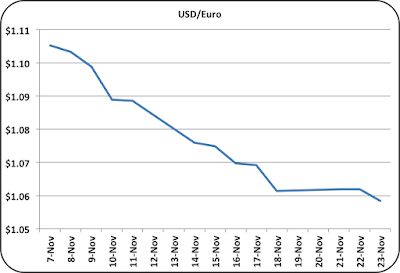 More detail on the USD strength is available in the November 27 post to this blog. While the future always remains uncertain, recent development are suggesting improved prices in 2017. November Class and Component Prices are now available. 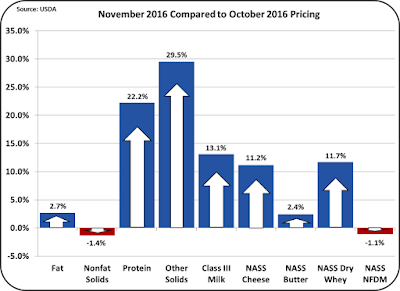 November was a very positive month for dairy prices. As shown in the dashboard chart below, many prices were up substantially. This resulted in a Class III price of $16.76/cwt., which is higher than any Class III price in 2015 and the second highest price in 2016. Based on the futures market, December prices should continue this increase. Is this another "Trump rally?" Are the President Elect's statements on killing TPP and renegotiating NAFTA having an impact or has there been a change in the fundamentals? 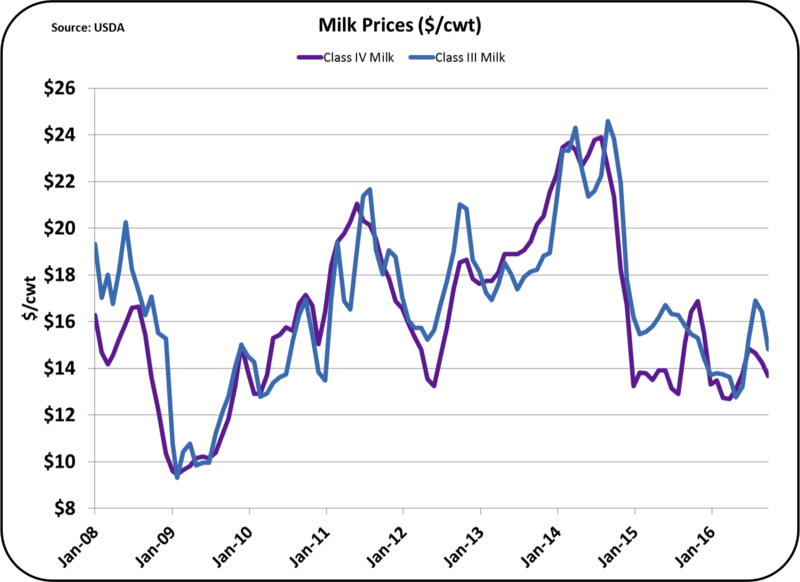 The analytics examined below suggest that fundamentals underlying dairy pricing are only slightly improved, but this could be interpreted as the start of a trend. The long-term trends for components are showing a return to more normal component prices. 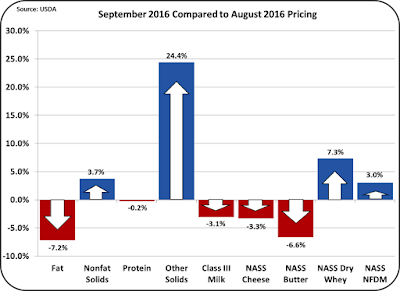 Milk protein increased 22% while butterfat remained close to the prior month. The price for Other Solids is returning to a more positive value after a year of very low near zero prices. Behind all this good news is a good balance of inventories. Not all data is yet available for October and November, but the data that is available shows lower inventory levels of the commodities behind the component prices. Lower inventories typically bring prices up. Cheese inventories are still high compared to 2012 through 2014 levels but they are declining slightly. 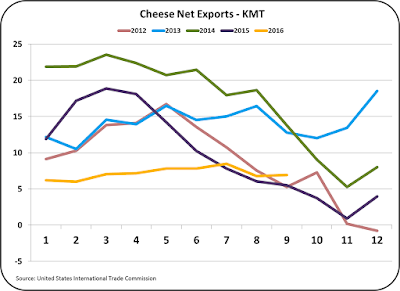 As reviewed in the November 13 post to this blog, exports of cheese remain anemic and imports remain near record high levels. While current production data is not yet available, a decrease in production must be behind this. Inventories of butter are following the normal cyclical pattern with a significant decrease in October. The current price of butter at $1.90/lb. is nearer to traditional levels and well below the "bubble" levels of the last 12 months. Some of the price increase for milk protein is caused by the current lower butter price. The chart below shows an analysis of the milk protein price broken into the contribution made by the cheese price and the butter price. 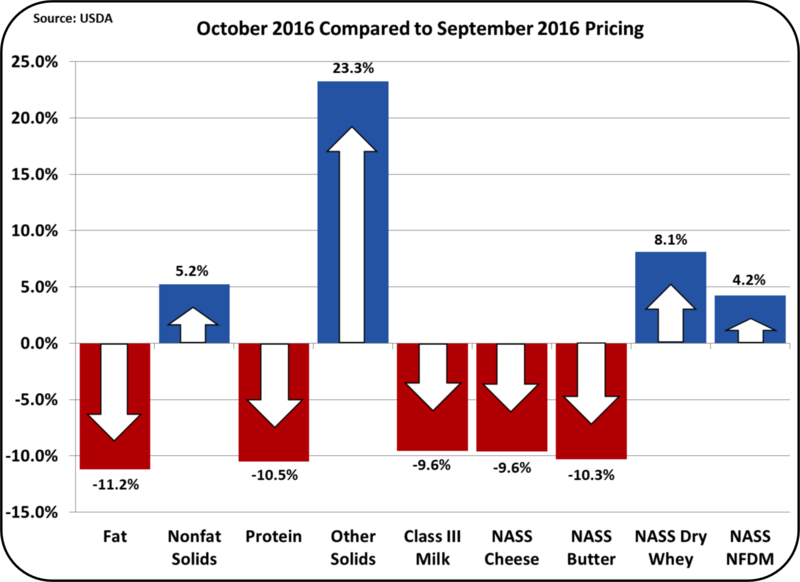 The decrease in the butter price and the increase in the cheese price have contributed equally to the higher milk protein prices. See the August 8, 2010 post to this blog for more detail on this relationship. The futures market is showing a return to butter prices above $2/lb. and cheese prices are expected to hold steady. 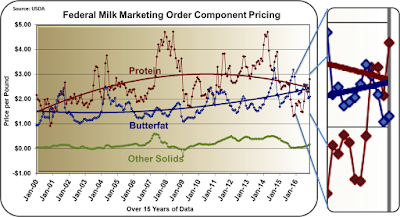 If the market follows this pattern, butterfat will increase in value and milk protein will decrease. 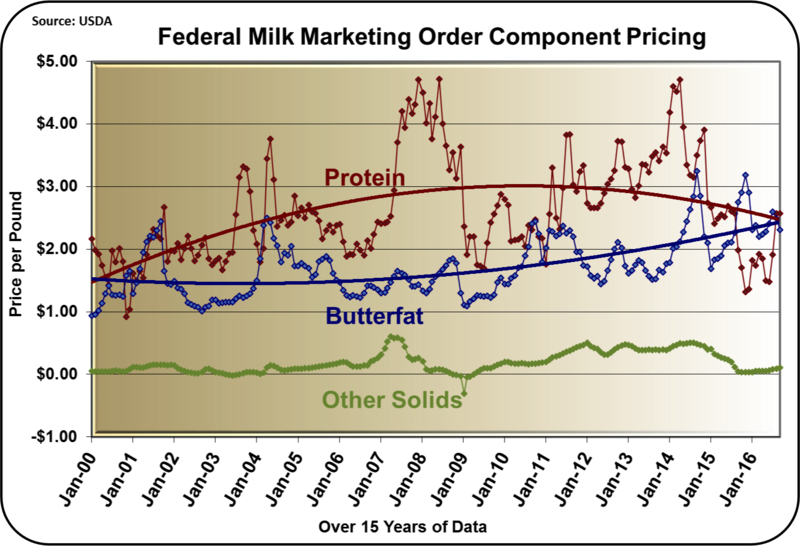 Changes in the price of butter have a minor influence on the Class III milk price, but do cause a shift between the price of milk protein and butterfat. Dry whey pricing is the basis for the producer price of Other Solids. Dry whey is largely an export item and has for the last year, been at very low prices. 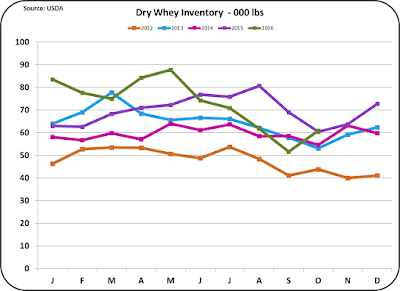 During 2016, dry whey prices have increased steadily. They started the year at just $.24/lb. and reached $.37/lb. in November. Inventories of dry whey are at a reasonable point and the futures market is showing further price increases. A return of Other Solids pricing above $.40/lb. can be expected. While Other Solids are currently contributing $1/cwt. to the Class III price, this could increase to $1.25/cwt. with the expected continuing increase in the value of dry whey. In November, milk protein contributed 50% of the value in milk. This makes a very clear case for prioritizing efforts to maximize milk protein. 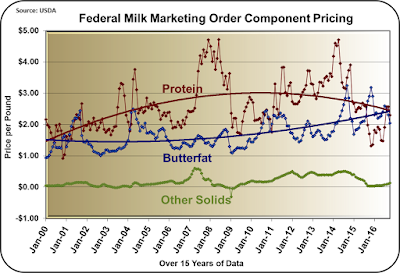 The butter price is expected to increase, shifting the pricing toward butterfat and away from milk protein. 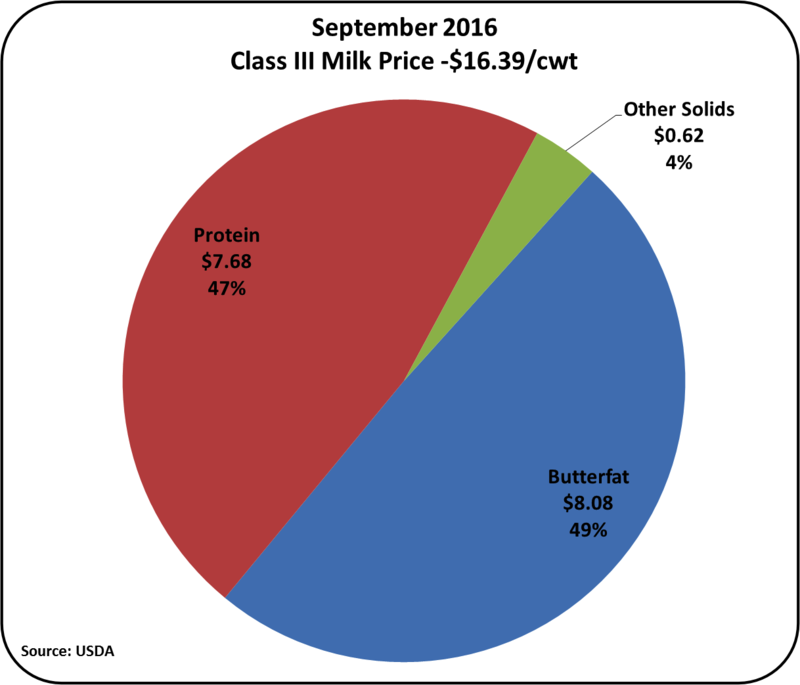 If this occurs, the pie chart would again favor butterfat as the major contributor to the Class III price. 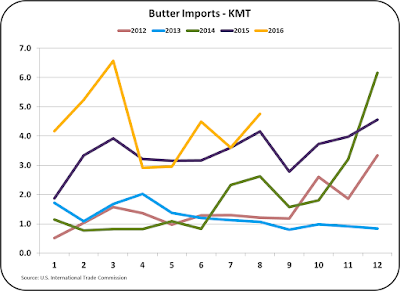 However, U.S. butter pricing remains well above the international price of butter, which may hold butter to a lower price than is currently expected in the futures market. These dynamics will continue to be followed in this blog as they play out. Additional data will soon be available on production, exports and imports. The next post will cover an analysis of these analytics. For now, futures pricing is showing some additional increase in the Class III price to the $17/cwt. level in December and throughout 2017. On the second Tuesday of November, American citizens voted for state and national leaders. The results were surprising and are well known. What is the short-term impact on the dairy industry? There is good and bad. The impact of the Trans Pacific Partnership agreement (TPP) on the U.S. dairy industry was covered in the October 16 post to this blog. Recent statements from the President-elect indicate that the TPP will be rejected in its present form. While there are opposing opinions on the impact of this agreement on the dairy industry, by the analytics reviewed in the October 16 post, the TPP would have increased price volatility and potentially had a negative influence on milk prices. Exchange rates have been reviewed in many past posts to this blog. A strong USD always means that U.S. exports will be more expensive on the international markets. That means that prices for U.S. products must be lower in order to compete. Below are the three most important charts for USD exchange rates that have a strong influence on dairy prices. They are shown for the period from November 7, the day before the elections, to November 23. 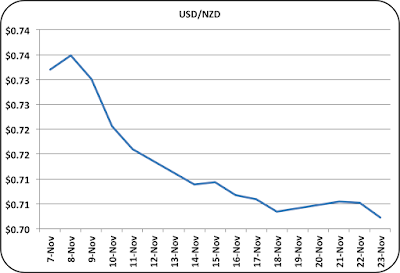 The first two charts show the USD vs. the Euro and the NZD; as Europe and New Zealand are the largest dairy exporters on the international markets competing with the U.S. In both cases, the USD has become increasingly strong. The change is somewhere around 4%. Mexico is the largest U.S. trading partner for dairy exports. Mexico is also a major partner for imports of butter. 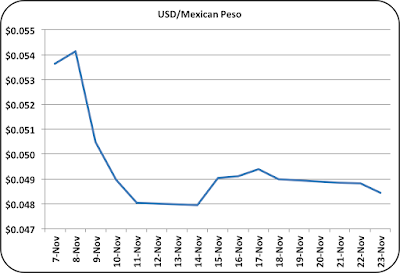 The change in exchange rates between the USD and the Mexican Peso is around 10%. 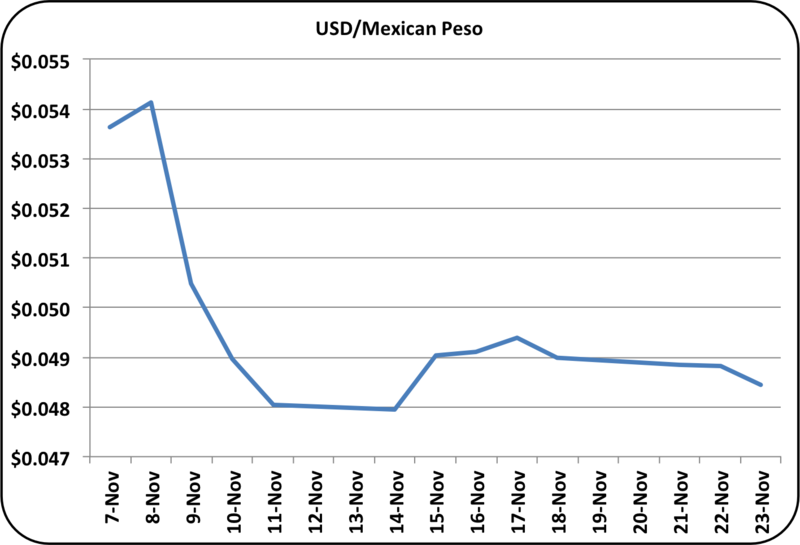 The drop in the Peso started as the election ballets were counted. With the surprising elections returns, there is also the possibility of revisions to NAFTA. The impact on dairy exports and imports with Mexico is unclear at this time, but a stronger USD and weaker Mexican Peso is not good news for dairy exports. During this same time span, cheese prices on the CME have fallen about 8%. 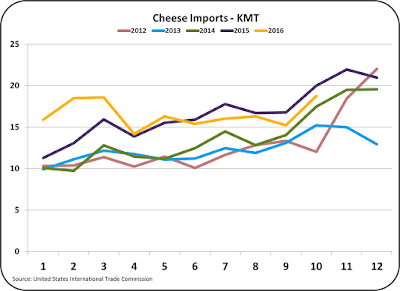 While there can be many factors influencing cheese prices, the impact of exchange rates and trade agreements are certainly a factor. One of two things will happen. 1. The stronger USD would make export volumes decline, increasing domestic inventories and thereby reducing domestic cheese prices. 2. With the stronger USD, export prices would drop to maintain the volume of exports, having a similar impact on domestic prices. Cheese prices are by far the most important factor in calculation of the Class III milk price (see earlier post). 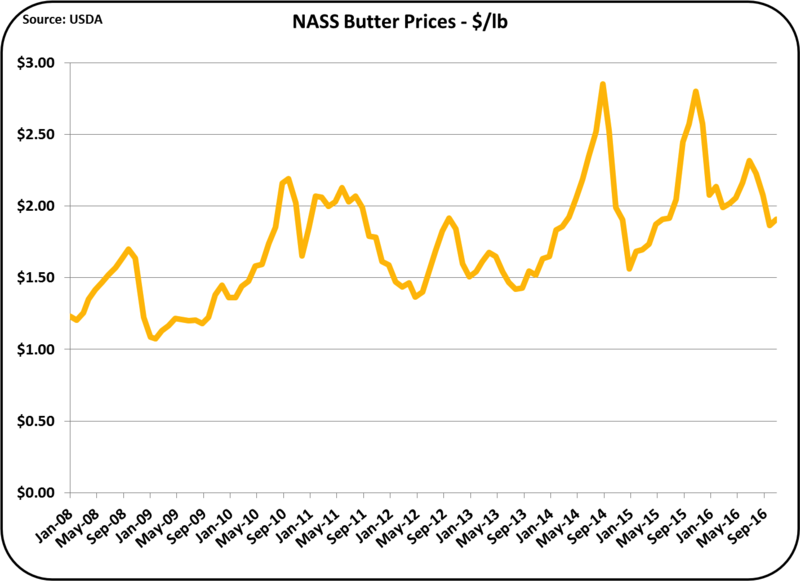 Butter prices have increased slightly during this time span and NDM prices have remained stable. 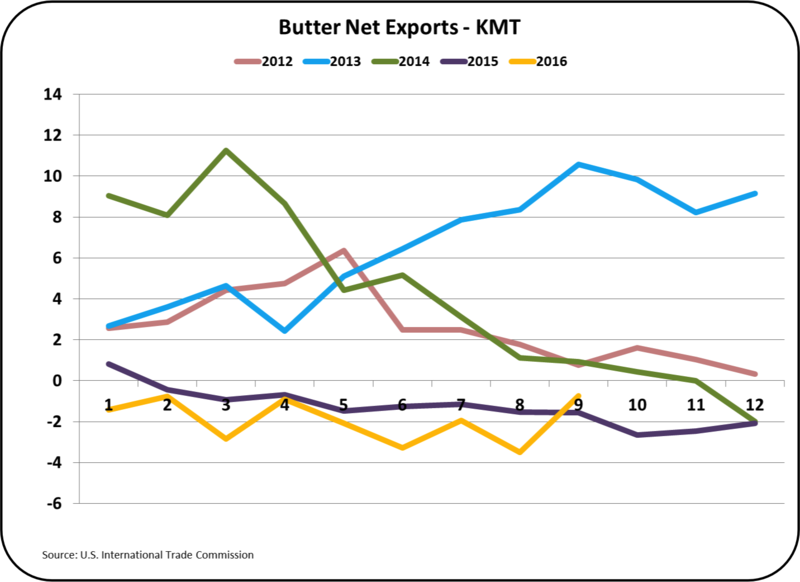 Butter exports are already almost zero, so the export price or the loss of export volume is not a factor for butter prices. Butter imports come primarily from Ireland, Mexico, and New Zealand and average around 6% of U.S. butter production. Except for NAFTA, butter imports are limited by the two tier quota and tariff specifications. Overall, the impact on butter prices is cloudy. NDM/SMP is largely exported. The largest export market by far is Mexico. The stability of the NDM price is surprising. NDM prices will continue to be followed in upcoming posts to this blog. Class and Component prices for November will be published on December 2. 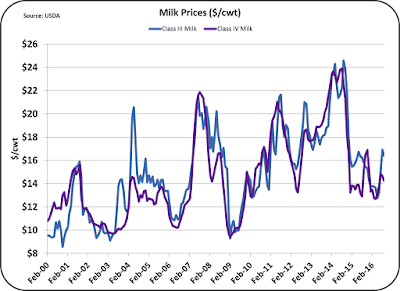 Current data would indicate that the Class III milk price will be well above the prior month. The next post will review the November Class and Component price announcement. 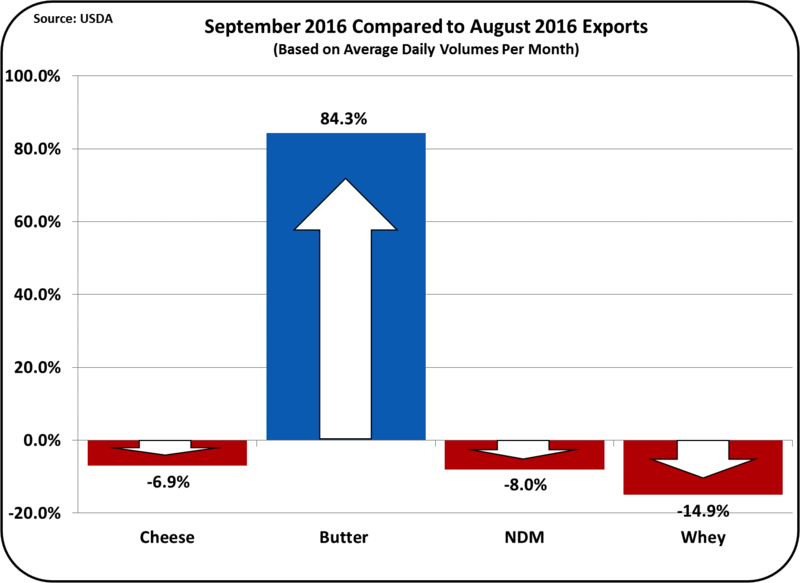 Dairy import and export data is now available for the month of September 2016. 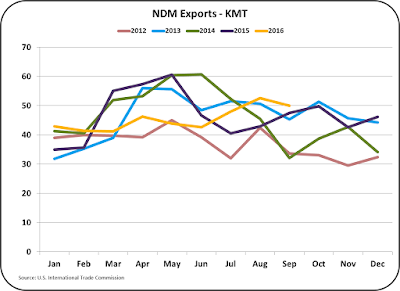 Exports of NDM/SMP remain robust, but at low prices. 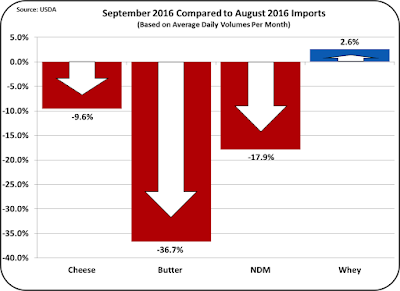 Exports of butter remain near zero and exports of cheese remain stable. 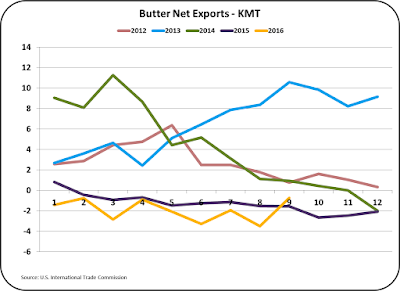 Net exports (exports minus imports) of cheese and butter remain low, as international prices remain lower than U.S. prices. 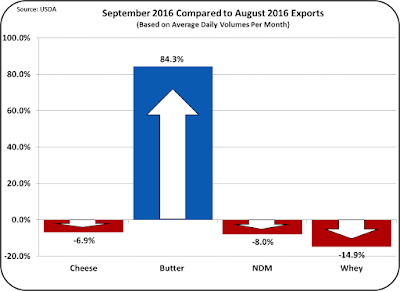 Shown below are the net exports of cheese and butter through September 2016. In each case, there is no obvious trend and net exports remain very low. If imports were not limited by the two tier quota and tariff program, net exports volumes would probably be lower prompting lower domestic prices. The phased elimination of the two tier quota and tariff process is one of the items included in the TPP agreement now before congress. See the October 16 post to this blog for more details on the TPP. The most significant export market for cheese and butter is Mexico. In the case of butter, more is imported from Mexico than exported. 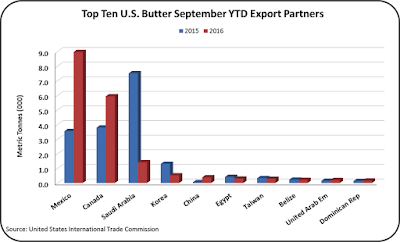 Exports of butter to Mexico have remained relatively stable while exports to most other countries have fallen. Imports recognize the lower international prices and international availability of butter. 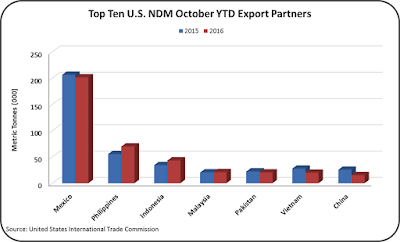 The real activity in exports is in exports of NDM/SMP. Exports remain robust compared to prior years. 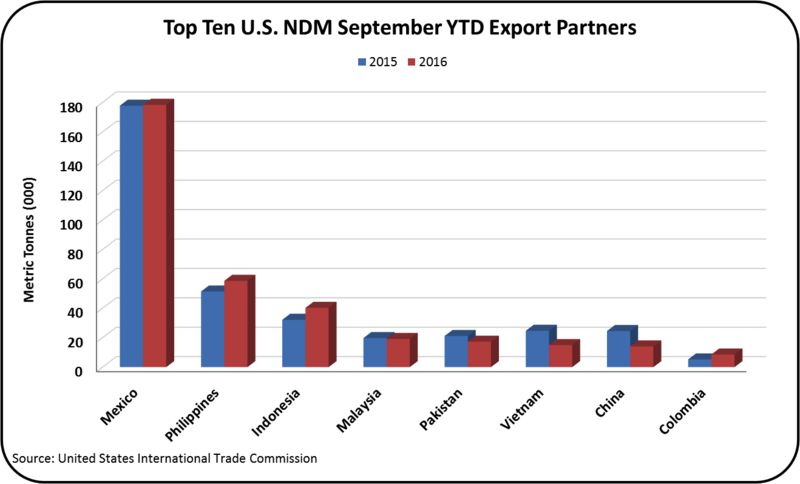 NDM/SMP exports hit a record high for the month of September. Unlike cheese and butter exports, NDM/SMP exports have not fallen since 2014. The largest customer for NDM/SMP is again Mexico. Nearly 50% of the NDM/SMP exports are destined for Mexico. How has the export of NDM/SMP remained robust while exports of cheese and butter have languished? The answer is really pricing. 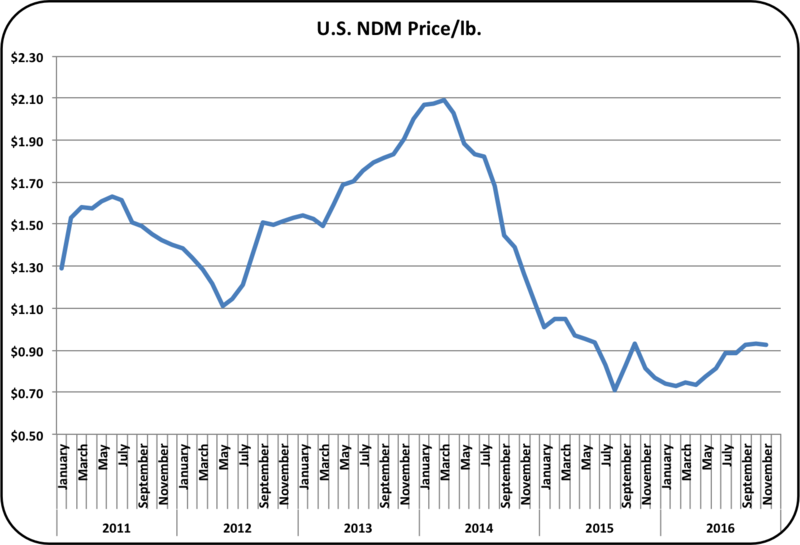 As shown below, while NDM prices have shown some improvement in 2016, they are still at a very low price compared to historical prices. U.S. pricing has remained very competitive with the other major exporters, the EU and New Zealand. The domestic price must reflect the export pricing because 54% of NDM/SMP is exported, unlike cheese and butter. Further price improvement is forecast in the futures market with NDM/SMP reaching prices close to $1.40/lb. compared to the current price of $.92/lb. This could impact overall U.S. dairy pricing as discussed in the prior post and covered in detail in an earlier post. From 2007 to 2013, production of SMP (which is an export only item) has nearly tripled. NDM production was up by about 14% during this same time span. 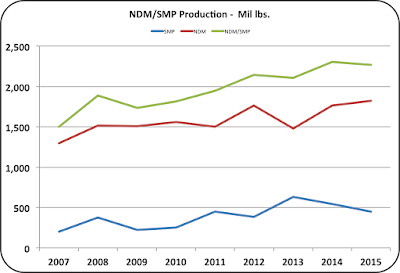 Ten years ago SMP amounted to less than 13% of the total production of NDM/SMP. 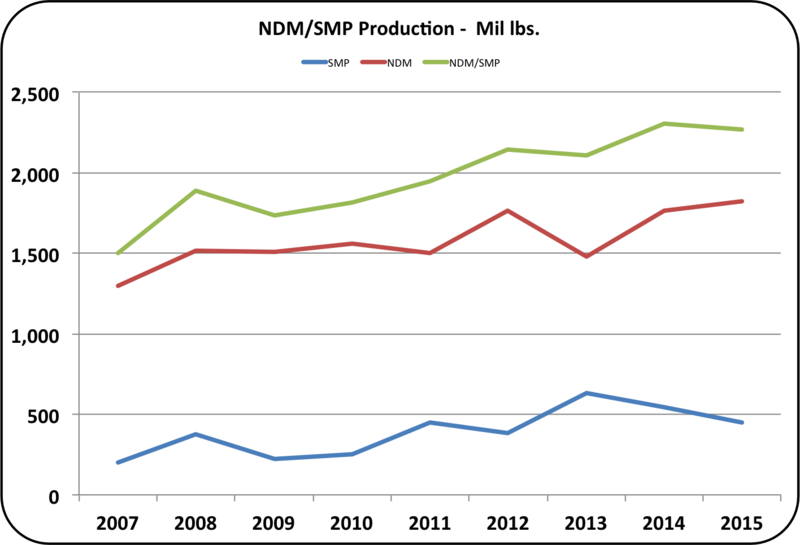 In 2013 it was 30% of the total combined production of NDM/SMP. However, beginning in 2014 to the present, total exports of SMP have declined due to competitive international prices and now are at about 20% of the total NDM/SMP production. Although the mix has shifted, the combined total is clearly growing. Imports of NDM remain robust, as there is available product on the international market at low prices. A lot is imported from New Zealand where there is oversupply. Competition from the EU has taken NDM volume from New Zealand Very little U.S. dairy product product goes to Canada, but a significant amount of NDM comes in. What is the difference between NDM and SMP? It begins with how the standards are set for each product. The standard for SMP is set in Geneva Switzerland while the USDA/FDA sets the standards for NDM. The subject is "complicated" and will be covered soon in a separate post to this blog. The most important item for milk pricing is cheese. In the next year there does not seem to be any major change in exports in the wind. This will leave an abundance of cheese available in the U.S., which will keep prices near current levels. This stable level of cheese pricing is reflected in the CME futures market. The most dynamic change to dairy exports/imports centers on trade agreements. The current election returns could influence this. Passage of the TPP could hurt U.S. exports of cheese and a revision of NAFTA could go either way. On November 2, Class and Component Prices were announced for the five week month of October 2016. The Class III milk price was a disappointing $14.82/cwt. While this price is down from the prior four months, it is above the first six month's of 2016. Overall, there were more down prices than up prices. As shown below, the major items of cheese and butter, and their formula linked milk components, milk protein and butterfat, were down. However, NDM and dry whey, the basis for Class IV pricing and "other solids" pricing, were favorable. The positive numbers will be reviewed first. The long-term trends shown below illustrate the value uptick of other solids. The increased price of other solids is up 23% from the prior month to $.14/lb. Because the price of other solids is determined by the formula below, further increases in the price of dry whey will have a dramatic influence on the value of other solids. Dry whey is expected to increase in price to $.40/lb. by the end of 2017. If that occurs, other solids would be valued at $.20/lb. and that would contribute an additional $.37/cwt. to the Class III price. Approximately 41% of dry whey is exported, so the price can be significantly influenced by international events. The price of nonfat dry milk is used to calculate the price of Class IV milk. The Class IV price is, in turn, used to calculate the Class II price, and when the Class IV price is above the Class III price, the Class IV price is used to calculate the Class I price. Therefore, the price of NDM can significantly impact the overall "uniform" milk price. However, for now the Class IV price is well below the Class III price. This could change as explained below. Like Dry Whey, NDM/SMP is a major export item. 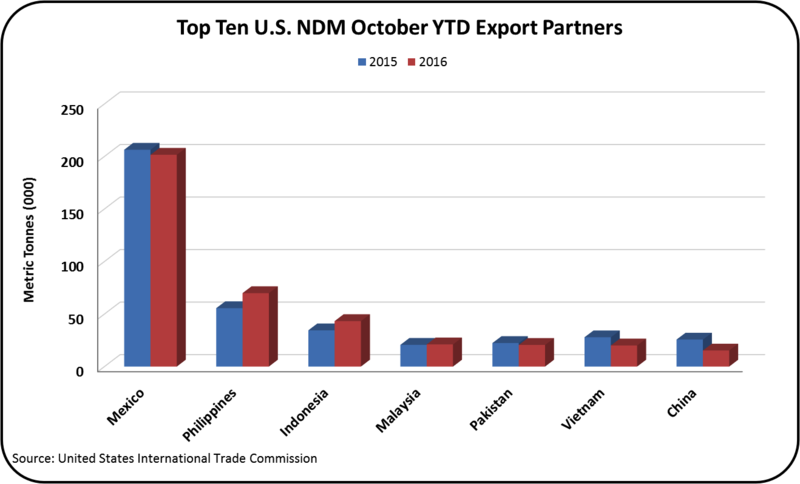 To date in 2016, 54% of NDM/SMP has been exported. The U.S. domestic price is very dependent on the international markets and prices. Currently, the global price for SMP is up approximately 30% from the May 2016 lows. However, the current price is still 50% below the 2014 highs. 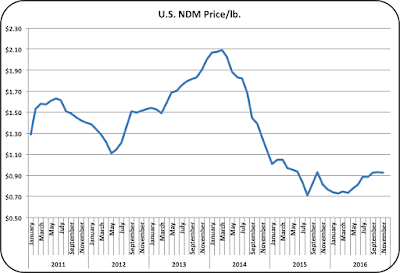 Significant increases are expected in 2017, which could increase NDM prices by approximately 35%. More will be covered on this in the next post to this blog, which will cover imports, exports, and global conditions. Cheese prices really control the Class III price and in turn control the uniform milk price (see earlier post). Cheese prices in October were $1.58/lb., down 9.6% from the prior month. This is the primary reason for the drop in the Class III price to $14.82/cwt. The price of cheese is expected to recover to the September price levels and remain in that area of $1.75/lb. for all of 2017. Cheese inventories remain high, up more than 20% from 2014 levels. This increase is far above increases in domestic per capita consumption. High inventories are holding prices down. While domestic consumption of cheese has continued to increase demand, exports have lagged reducing demand. In August, cheese production did drop, but with the continued low exports (and increased imports) high inventory levels are likely to remain. The next post to this blog will cover exports and imports when more current information is available. 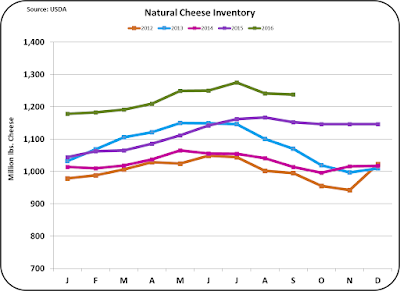 Little change in the cheese markets is expected in the near term. Exports remain week, imports continue to grow, and production continues to outstrip demand. 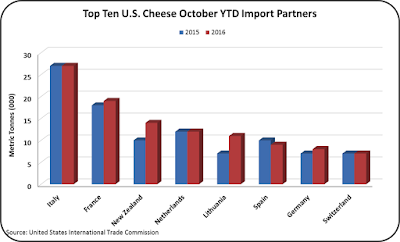 If the TPP is approved (see prior post), imports could surge resulting in additional pressure on cheese prices. 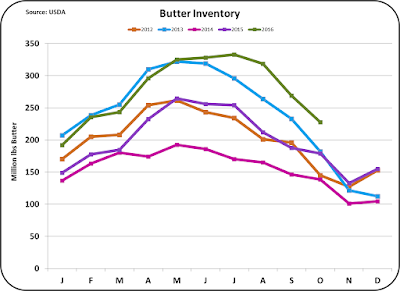 Butter is also seeing price pressure as inventories are well above year ago levels. Butter prices have fallen below $2/lb. 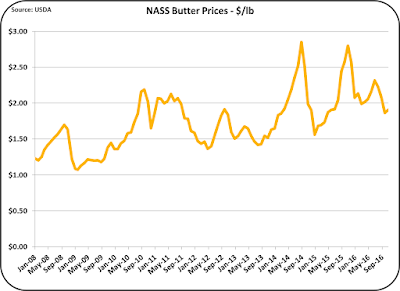 The October NASS price was $1.86/lb. However, this price is still well above the international price of butter. Therefore, exports are near zero and imports are limited only by the two tier tariff and quotes program. The TPP, if implemented, could really upset this market balance (see prior post). 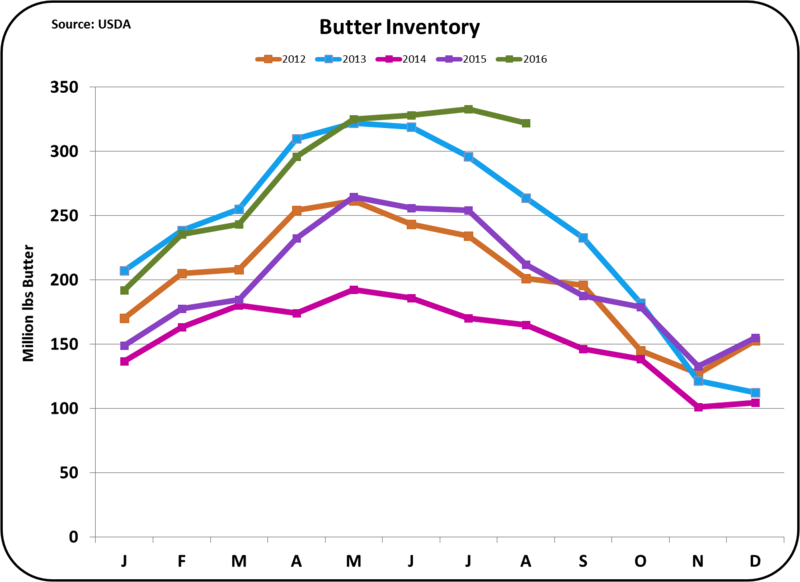 Churning in August fell to a five year low which helped keep butter inventories from ballooning further. While the price of butter has a direct effect on the butterfat price, it also has an opposite effect on the price of milk protein (see earlier post). 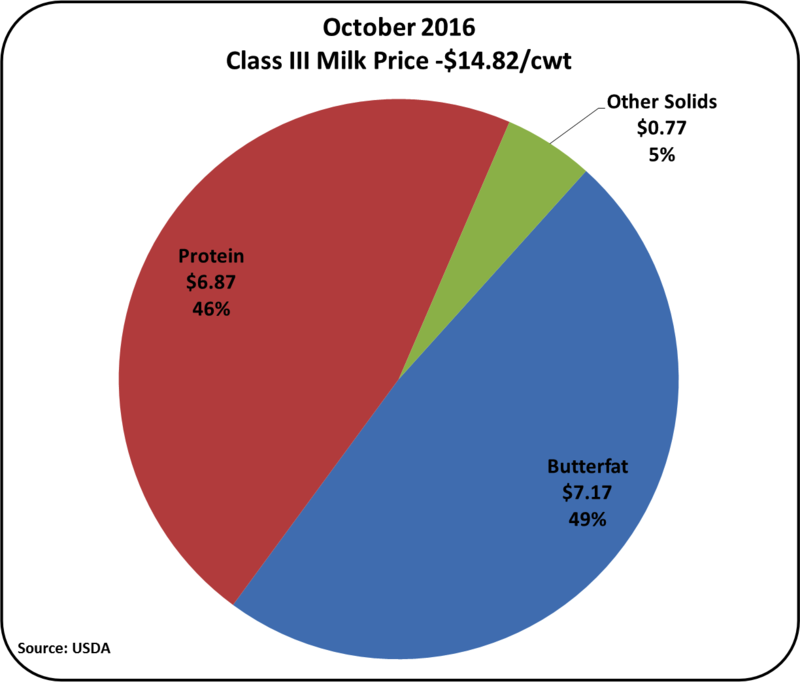 As a result, the Class III price is only slightly impacted, but an increase in butter prices does shift revenue from milk protein to butterfat. 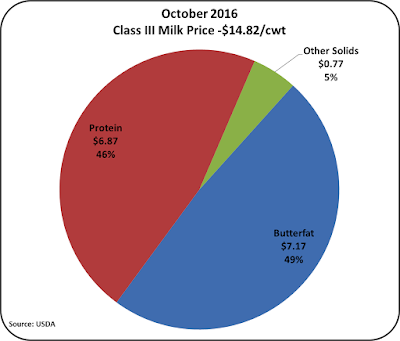 The pie chart of the components of the Class III price for October shows a close split between milk protein and butterfat. The cheese and butter markets are not expected to significantly change in the next year. However, the dry whey and NDM markets are expected to strengthen. The "wild card" in the futures crystal ball is the TPP. Passage of the TPP as it exists today would eliminate level one tariffs immediately and then phase out quotas for level two tariffs as level one volumes expand. This could be a major game changer. More on TPP - Good or Bad for the Dairy Industry? The Trans-Pacific Partnership agreement (TPP) has been previously mentioned in this blog. On September 18 free trade agreements in general were discussed and the October 2 post discussed the maximum Somatic Cell Count allowed for the U.S. vs. international standards. Additionally, there is more information available in two of my recent articles published in Progressive Dairyman - Free Trade Agreements and SCC. In this post I will review some of the published analysis material available on the TPP as it applies to the dairy industry. The TPP, if approved, will impact the dairy industry. To date the TPP has not been approved by congress. If the TPP is not passed, other forms of free trade agreements will no doubt be developed and approved. In general, by increasing competition, trade agreements typically reduce consumer costs, but they also create an environment that causes an industry to adjust. When adjustment occurs, some businesses gain and some businesses lose. There has been a lot of study on the impact to various industries, and the information discussed here is generally available. The two most comprehensive documents are by the U.S. Agricultural Sector/American Farm Bureau Federation and the U.S. International Trade commission. They both depict a favorable impact from passage of the TPP. Exports would increase, domestic producer prices would increase, and there would be very little impact on imports. The published data show an expectation of increased exports of $1.85 billion annually and increased imports of $427 million annually. The increase in exports will come primarily from Canada (60% of the increase) where the closed market will be opened to some dairy products. This would be a dramatic change for Canada, which has kept its dairy industry very closed to imports. The increase in imports would come primarily from New Zealand (60% of the increase) and would consist of mostly high-protein powders. 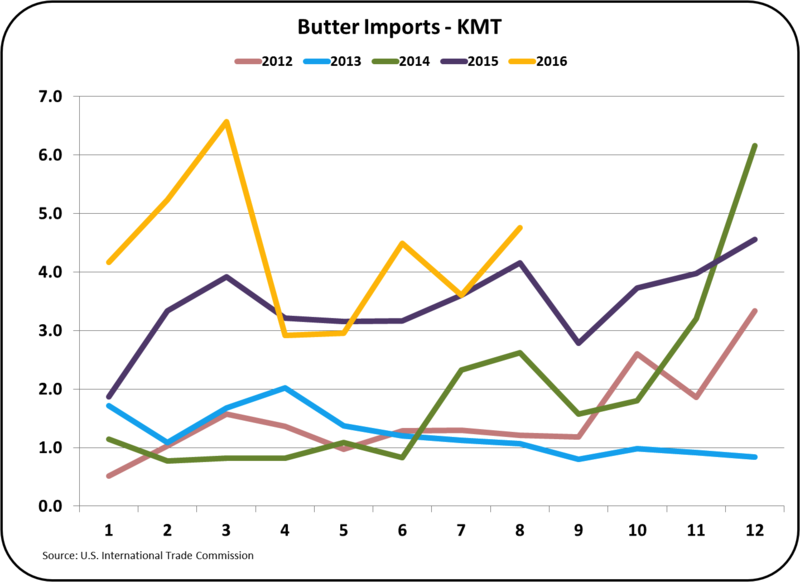 The data does suggest that current limits on butterfat imports will be significantly increased, thereby increasing imports and reducing the price of butter. The other major assumption behind the data is that U.S. produced dairy products are generally lower priced than the international market, so few additional imports will occur. The studies were based on pricing data from the 2014 period when prices were very different than they are in 2016. In 2016, U.S. dairy prices are above international prices and imports have swelled. Dairy product imports to the U.S. are kept at a minimum by the established two-tiered system where a limited amount can be imported at tariffs in the range of 10% to 25%. Above the first tier quotas, the tariffs increase dramatically to essentially eliminate further imports. By the terms currently in the TPP, the tariffs on the first tier quotas would be eliminated totally and immediately. The volumes allowed would be increased dramatically in many cases. For instance, New Zealand would be allowed to ship significantly larger volumes of cheese duty free to the U.S. The volumes allowed would continue to increase incrementally over 9 years, and would then be unlimited. In all, first tier tariffs are being eliminated for ten countries. The changes are very different for U.S. dairy exports. Only Canada, Japan, and Malaysia are creating new TRQ's for imports of U.S. produced dairy products. In the case of Canada, quantities are very limited and phased in over 14 or 19 years and then fixed at those amounts. Similarly, exports to Japan are also very small amounts and are phased in over 12 years and then fixed. What is not covered in any analysis is the subject of volatility. The analysis described above was done at a time when U.S. imports were minimal and exports were growing nicely and prices were high. The year 2016 is not that kind of year. The year 2016 is an example of the volatility brought on by the huge swings in export/import volumes and international prices. 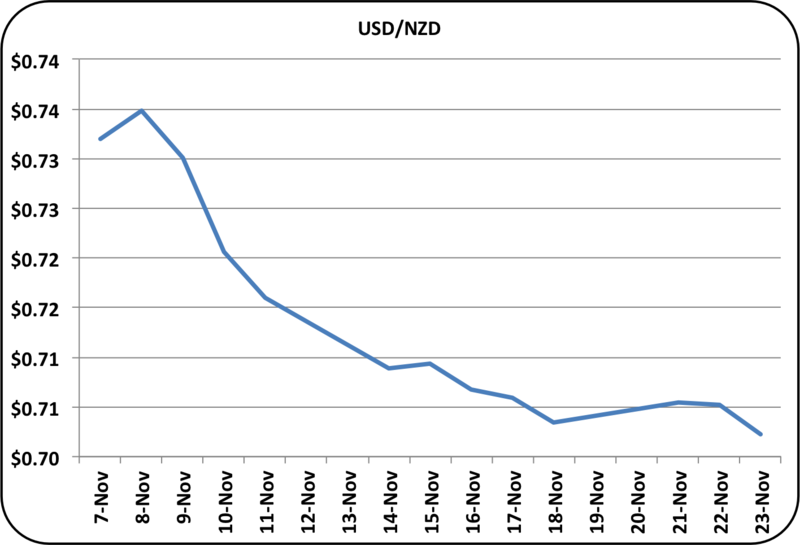 In 2008 to 2010, exports were impacted by swings in the exchange rates between the USD and the NZD. Producer prices went form $20/cwt. to $10/cwt. In 2015 and 2016, import/export volumes and prices were impacted by a very strong USD, a Russian embargo, a lifting of quotas in Europe and lower dairy imports in China. What is on the horizon next? Free trade agreements as defined in the TPP will certainly increase the volatility caused by international events. The trade agreements are complex and involve many products. Any sector can be adversely impacted in exchange for other sectors, so it's very difficult to say if this trade agreement in total is "fair." The impact on the U.S. dairy industry, as analyzed by the U.S. International Trade Commission, appears to be slightly positive by the calculations provided, but there is a potential down side from international events and there will certainly be increased volatility. Dairy is a "different" business compared to many other industries. Producers are probably the most impacted. It's difficult to tell a cow "you're fired." Dairy production is capital intensive and individual countries like to be self-sustaining. The key for producers seems to be maintaining a very low cost/high margin structure while learning to manage price volatility through financial tools such as hedging. Dairy processors use hedging extensively to manage volatility, but few dairy producers use hedging. Producers also need to manage not just to reduce costs, but also to manage to high margins. The industry is filled with examples of reduced costs, especially in feed, with the result that milk components are compromised resulting in net margin decline. Successful production management is much more complicated with the increasing free trade agreements and globalization. Those who survive must become sophisticated managers with good analytical analysis of their business and proper actions based on these analytics. The analytics must include national and international events as well as local herd events. On October 5, September Class and Component Milk Prices were announced. 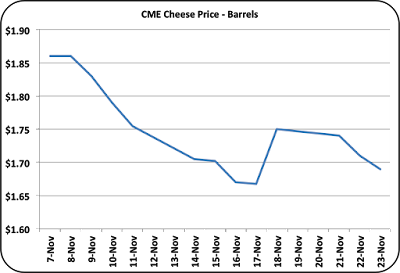 The Class III milk price fell slightly to $16.39/cwt., a 3.1% loss. Milk protein prices held at $2.57/lb. while butterfat dropped 7.2% to $2.30/cwt. Other solids increased 24% to $.11/lb. on an increase in the value of dry whey. The cheese prices fell slightly to $1.75/lb. but continued near the 2016 high point established last month. The price level for the last two months reflects a price not seen for cheese since January, 2015. 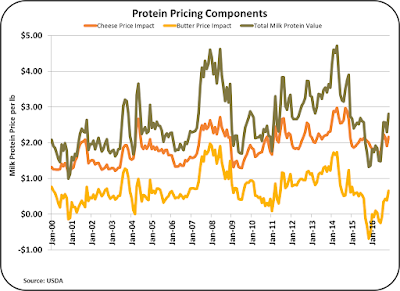 The relatively stable cheese price and the lower butter price brought the current prices for components more in line with the long-term trends. 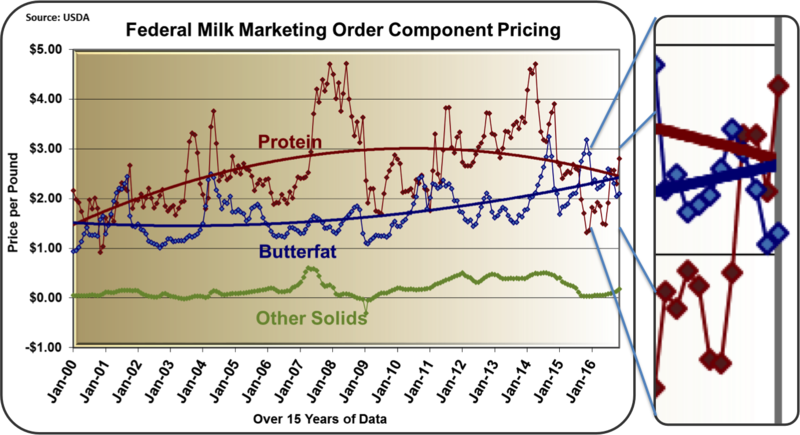 Protein held its value while butterfat fell. 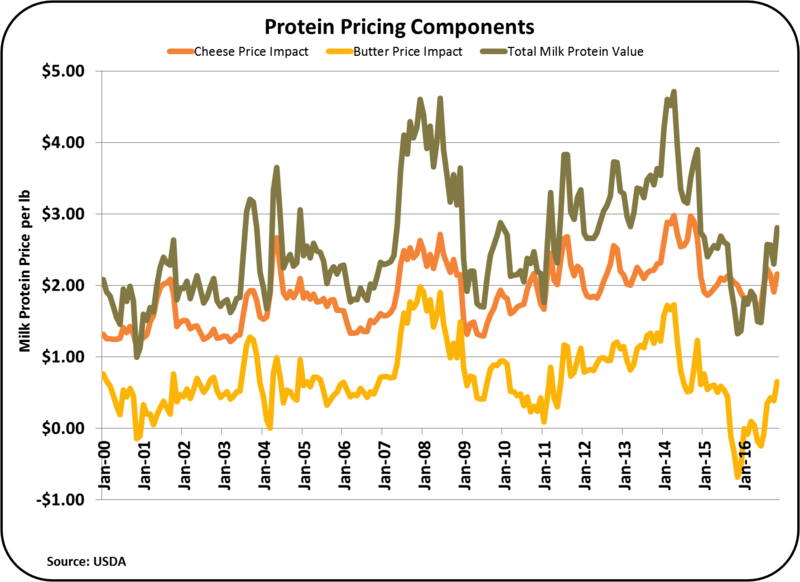 Cheese prices are the primary determinant of the Class III milk price and butter prices shift value between butterfat and milk protein. The math behind these relationships was reviewed in the prior posts listed below. "Is Milk Pricing really tied to Cheese Prices?" "The Math behind Milk Protein and Butterfat Pricing"
The pricing for milk protein and cheese also brought the pie of components back to a more normal relationship with milk protein contributing 47% of the value to the Class III price. 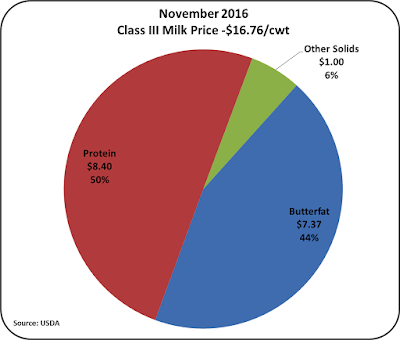 Butterfat retained its strong share of the pie chart, above historical proportions. Nonfat dry milk prices were up 5% at $.89/lb., a high for 2016. This will increase the price of Class II and IV milk, but it is not enough to make it become the basis of the Class I milk price. The current price will increase the uniform price slightly and provide a higher Producer Price Differentials. While a lot of NDM was exported in August, it was sold at a low price, keeping the Class IV price well below the Class III price. For more detail on how NDM prices can be a major influence on Uniform milk price, see this prior blog post. Imports and exports are the most volatile component of demand for U.S. produced dairy products. The most recent data on exports shows strong volumes of exports. However, exports in August were strong in volume, not dollars, and were driven by strong exports of NDM. 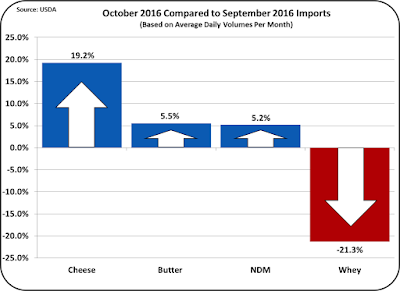 A review of the data shows that exports of cheese and butter remained very low and the NDM was sold are low prices. While there has been recovery in overall export volume, it has not had an impact of the key items important to domestic dairy producer prices. However, there is encouraging data in the developing prices of the key dairy exports. 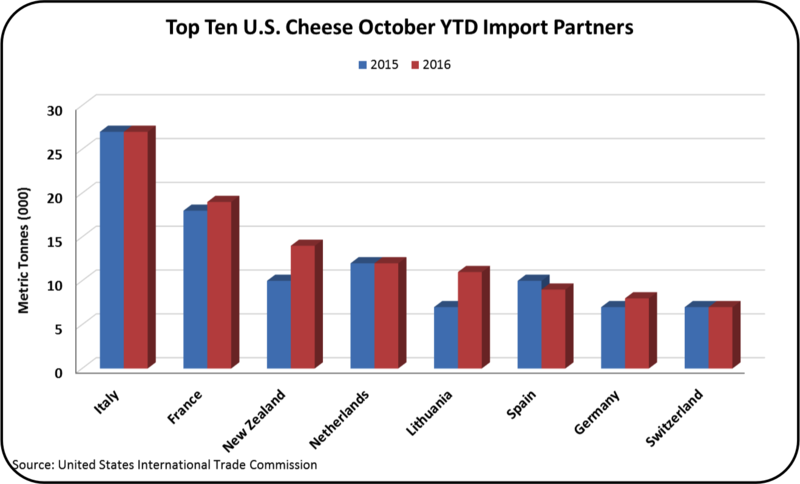 The higher U.S. prices for cheese and butter have made exports difficult and imports more attractive. While the dairy export and import volumes are always a month behind in availability, international prices are available almost immediately. The comparative pricing is encouraging. The international prices for cheese are at almost identical prices for Europe, Oceania, and the U.S. The price for SMP is also nearly equal for all the major competitors. 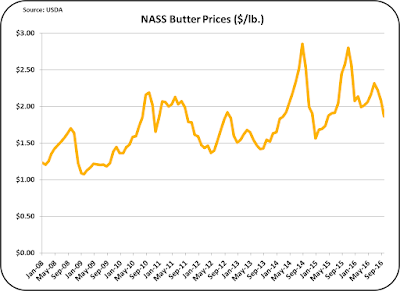 Butter pricing is mixed as European butter has increased in price, but Oceania butter is still well below U.S. prices. That should play into improved exports and fewer imports. In all cases, the leveling of prices is a combination of lower U.S. prices and higher prices for the other international dairy exporters. In addition to the lag in the data for exports and imports, there is an additional lag in the process for international purchases and shipments, there appears to be a developing competitive environment favorable to U.S. exports, but it will probably take the rest of 2016 to more fully develop. Given time, this should have a favorable impact on U.S. dairy prices. Inventories of domestic cheese showed a favorable trend in August. 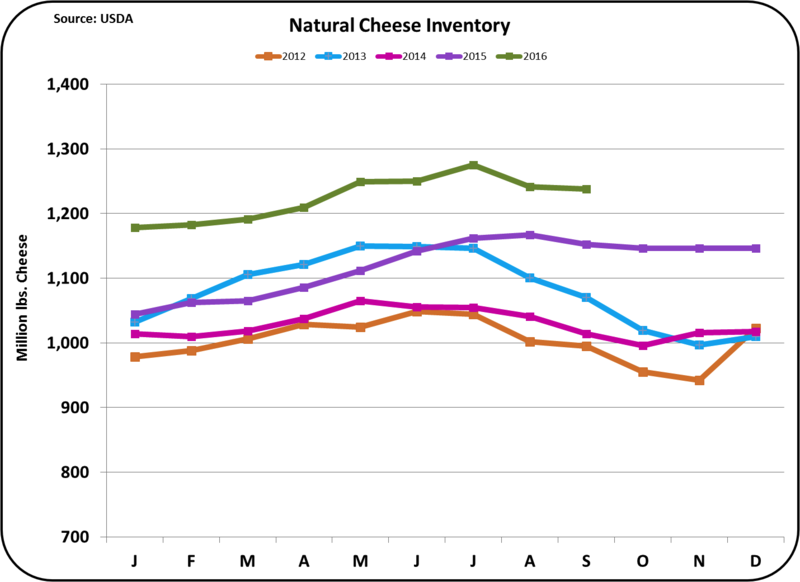 After a build-up of cheese inventories in the first seven months of 2016, inventories fell a little in August. 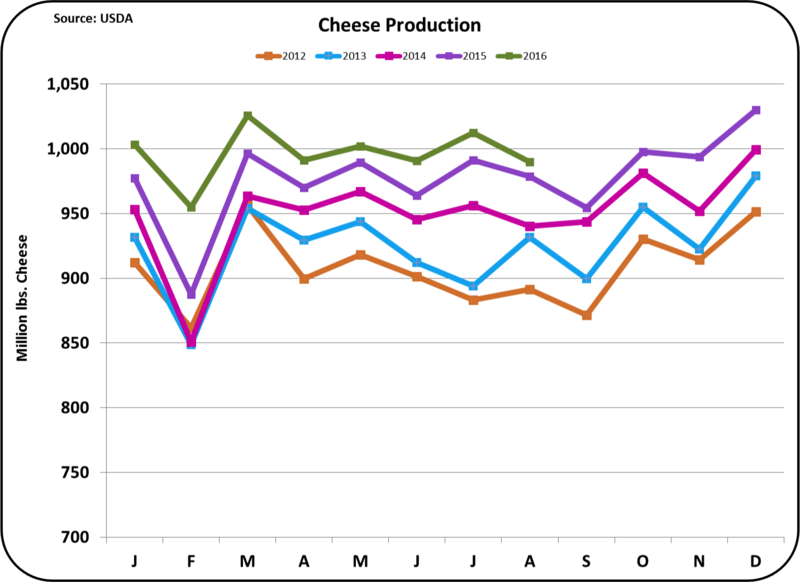 While this is normal pattern for August, it is a positive step toward bringing cheese inventories more in line. 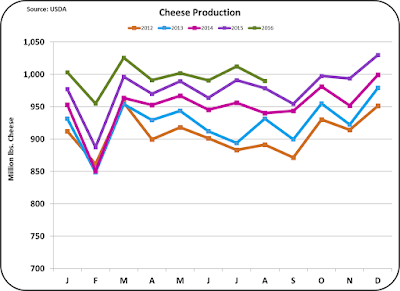 There was also a reduction in cheese production in August which was also an encouraging analytic in reducing cheese inventories. However, there was little help from exports/imports in August. Exports were down and imports were up resulting in a decline in net exports. Butter inventories continue to remain high and prices continue to fall. Butter churning fell in August, but imports continued to grow. 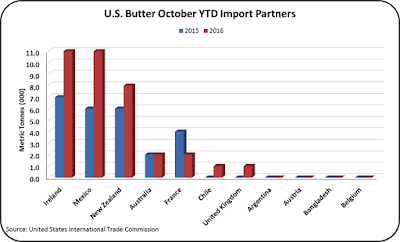 Butter is being imported in increasing quantities from Ireland, Mexico, and New Zealand. The market indicators are certainly mixed and that makes future pricing and timing difficult to access. There is an abundance of news that global dairy markets are correcting. However, there are still excesses that must be reduced before market forces are in balance. The futures market is predicting lower milk prices in the near future. The recovery that is starting to take place is progressing slowly. The impact of trade agreements and harmonization of global dairy standards presents another dynamic that is difficult to predict. (See the two prior posts - September 18 and October 2, 2016 - for some additional detail of trade agreements.) Overall, it appears that recovery of producer milk prices will be slow and volatile.